Happy Friday! So here is the Valentine's Day card you will make in the Note Card class tomorrow. I wanted this card to be simply sweet, and I think I have. 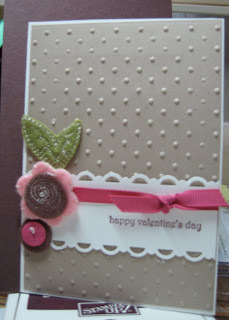 I ran a piece of kraft card stock through the big shot in the polka dot embossing folder by Stampin' Up!. I then used the new scallop trim border punch along both horizontal edges of the card stock. I stamped happy valentine's day in Bravo Burgundy. Tied a piece of rose red 1/4" grosgrain ribbon around the white card stock. I used glue dots to hold the new felt flowers onto the card, and viola! Quick, easy, and I think sweet! Perfect for a friend, an aunt, or your sweetie! Thanks for looking, and I hope that this jump starts a great weekend for you! Very pretty! Love your blog. I'm going to sign up to be a follower. Please enter me into the blog candy giveaway. Thanks. I just ordered this folder and am waiting for it. I love yourcard. Please enter me in your give away. Very pretty card. I love the embossing folders. I just love dot embossing folder. Your card looks fabulous. Thanks for blog candy. Let me win! Wow, wow, wow Sharon -- I am so in love with your blog design and colors. I have never heard of CASING somebody's blog design, but I would CASE yours for sure if I knew how to do it. Anyway, I loved looking at your posts this month, love your craft room. You are so talented. Thank you for sending e-mail regarding blog candy, please enter me; but more important: we were all winners because we have a new blog to visit! Love this card and your craft room also--wish I had one--been trying to convert a bedroom just haven't got there yet...Congrats on your blog and upcoming B'day!! Love this, so elegant. Thanks for sharing!! I really enjoyed browsing your blog. I am jealous of your craft room. It's very nice. Happy birthday and thanks for the chance to win blog candy! I love your blog and am so jelous of the wonderful organization of your craft room. I never think to emboss, but your dots on this card really make it pop. Thanks for the chance of winning blog candy, fingers are crossed (toes too it couldn't hurt). Oh so pretty!!! I am going to have start using some embossing folders. Thanks for the chance to win some blog candy!! Cute card!! I've been "organizing" my craft room for the past month! Maybe one day soon I'll post my own pics. Congratulations on your 100th post! I love this card. I've been debating getting this embossing folder and this card made the decision for me. I so love what you did with this card. The embossing folder has to be my favorite. It really 'grabs' your eye no matter how you use it. Thanks for offering up some blog candy and for sharing your wonderful creativity with all of us. Glad to follow you! First, HAPPY BIRTHDAY early!! Second, congrats on the 100th post! 3rd, Eddie is adorable!!! Your card is very beautiful! That new embossing folder is my FAVORITE new toy!! I am already a follower and love your work. Beautiful card! The simplicity of the design really accents the wonderful Sweet Pea felt flower!